Megan Evans wrote on The Huffington Post about suffering from "femme invisibility." Megan is a "femme," which is a term for a feminine-looking lesbian. If you are a "femme," the world assumes you are heterosexual because you do not match the stereotypical image of a lesbian, i.e., "short hair, no makeup, wearing baggy jeans and a t-shirt." The problem is two-pronged: it is difficult to attract other lesbians and you have to ward off heterosexual males because other lesbians and heterosexual males assume you are heterosexual. The crux of her post is how to overcome femme invisibility? She suggests that some relief has come from the fact that "the representation of lesbians has risen on TV. 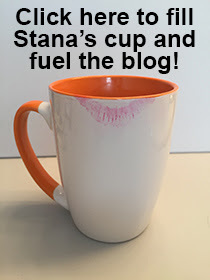 In particular, there has been an influx of femme lesbian characters." Additional relief has come from femme celebrities, who have come out as gay like "Portia de Rossi, up-and-coming actress Amber Heard, Miss California hopeful Mollie Thomas, and country singer Chely Wright." Also, she launched a Femme Visibility campaign on her "blog, What Wegan Did Next, with the simple plan of inviting femme lesbians to send in their photos and together take a step toward shattering stereotypes and pulling off our invisibility cloak." After reading Megan's post, I realized that femme lesbian transwoman also suffer from "femme invisibility." We are unable to attract other lesbians and we have to ward off heterosexual males because other lesbians and heterosexual males assume we are heterosexual. If you are a happily married femme transwoman (like I am), the inability to attract other lesbians is a good thing, but we still have to deal with heterosexual males who are on the make. Television is not much help. TV transwomen come in two flavors: the men in dresses (à la Work It) and the drag queens (à la Ru Paul's Drag Race). The handful of trans femmes on TV have been so short-lived (the average trans femme character lasts one episode of a TV show) that they have not made much of an impact on the public's image of a transwoman. They still think we are either men in dresses or drag queens. I don't have a solution. More femme transwomen characters on TV and in film might help. And more femme transwomen coming out as lesbians might help, too, but who knows? We have enough trouble coming out as transwomen; coming out as lesbian transwomen might be pushing the envelope too much too soon. Maybe one step at a time is the way to go; first step: gender, second step: sexuality. By the way, when a guy comes on to me, I usually manage to dissuade him off by pointing at my wedding ring. Again, our thanks go out to Femulate reader Oak for the links. After my shopping spree on Wednesday, I met the girls (Angela, Diana, Maryann, and Robin) for afternoon tea at a Tea Roses Tea Room in downtown Cromwell. I have never been in a tea room in my life and I am not much of a tea drinker, but I looked forward to the experience. It was a very feminine adventure. All of the customers and all of the staff were female and the room was beautifully appointed in a most feminine manner. You can get a glimpse of the room in the accompanying photo as well as in the photos on the tea room's website. It was also very relaxing; we spent two hours doing our afternoon tea. Each of us had an individual large pot of tea (I had "Cheeky Peach"), and we had munchies to eat including delicious scones, delicate tea sandwiches, and yummy mini-desserts. I arrived on an empty stomach and when I looked at the spread of food, I had my doubts that my appetite would be sated, but it was. I had a very enjoyable time and I would love to do it again. Wednesday was another day of affirmation of my womanhood. When I parked my car at the mall at the start of the day, I had that usual moment of hesitation. But after a minute or two, I gathered myself emotionally, swung open the car door, exited the car, and walked to the mall entrance. Listening to my high heels clicking on the pavement affirmed what I was doing and there was no stopping me. Everyone treated me respectfully. I'll never know if they read me or not, but no one indicated that they did and no one disrespected me. I smiled at other women passing by in the mall and always returned the smile and sometimes they initiated the exchange of smiles. I noticed one woman checking out my bootines and another spent an inordinate amount of time checking me out while she browsed the racks near me at Macy's. When I caught her eye, I smiled and that seemed to disarm her --- she smiled back and stopped checking me out. It was wonderful and I am already planning my next time out en femme. "Bead detail along the round neckline frames this black Alex Evenings mesh gown with elegant sophistication. A criss-cross ruched empire waist softens the fit and elongates the look." Isn't it beautiful? I can't wait to wear it! I was out all day en femme yesterday. I wore my Victoria's Secret kelly green sweater dress, Payless tan bootines, Kohl's animal print scarf, and Fashion Bug white fake fur jacket. I hit the first mall (West Farms Mall) at 10:30 AM and headed straight to the dress department of JCPenney to search out the dress I saw on their website. I quickly found a rack of that very dress and there was one in my size. I also found two other dresses to take into the fitting room. After I stripped down and prepared to try on my finds, I noticed that the dress that brought me to JCPenney in the first place had a huge brown stain near its hem. It looked as if someone had stepped on the hem with muddy shoes while they were trying on the dress. I was disappointed as it was the only one in my size, but I tried it on anyway to see if it fit, and if it did, I could try another JCPenney store or order it online. I had a hard time pulling up the zipper with my long nails and with the dresses low back, I was not sure if I had zipped it up completely or had a ways to go. I just assumed it fit and planned to try another JCPenne later. I tried on the other two dresses, as well as three more that I shagged during my second search through the racks, but they were so unimpressive that I cannot recall a single one. Only one hour into my day out and the balls of my feet already hurting. I assumed that the 4-inch stiletto heels of my bootines were the source of my pain, but whatever the source, my feet were not going to take me to the opposite end of the mall to Sephora. Also, I wanted to shed my fake fur. It was too hot wearing it in the mall and I could tolerate the mid-40 temperature outdoors without outerwear for the short time out between my car and a mall entrance. So, I went back to my car, shed my jacket, and drove to the other end of the mall. I had a shopping list for Sephora. I needed to replenish my powder foundation, translucent powder, makeup setting spray, and I had to replace the wig comb that I lost or misplaced. A Sephora sales rep greeted me and helped me find everything on my shopping list. While shopping at Sephora, I encountered the sales rep who did my makeover over five years ago. She greeted me as if we were old friends, but just to make sure, I asked her if she remembered me. She said she did and when she described that encounter way back when, I knew that she really did remember me. I thanked her for the words of wisdom she gave me during that makeover ("You only have one life to live and you should live it like you want. If someone has a problem, then it is their problem, not yours.") I have lived by those words ever since that day and I have been very happy doing so. Paying for my purchases, the cashier complimented my perfume (Chanel No. 19) and informed me I had enough Sephora points to qualify for a free gift. I chose a tube of makeup primer, paid for my purchases, and headed for the exit. Since I had parked at a Macy's entrance, I made a quick trip through their dress racks, found a couple of potential items, tried them on, but rejected them all. So I left the mall and drove to another mall (Westfield Mall) to try my luck at JCPenney. Twenty-five minutes later, I arrived at the mall, but before heading inside, I decided to switch footwear to the flats I had recently purchased from Avon. Initially, they seemed comfortable, although they were a little tight. The "seemed" comfort lost out to the "little" tightness in short order. In JCPenney, I found a rack of the dress of my quest. There were fewer dresses on this rack than at the other JCPenney and I thought that my odds of finding my size were not good. Lucky me: after checking the sizes of all the dresses on the rack, the very last dress I checked was in my size. I grabbed two other dresses with potential and headed to the fitting room where I encountered the same zipper problem I had encountered with the soiled dress. Had I zipped it up all the way or not? I managed to slip my arms out of the sleeves and revolve the dress 180 degrees to see what was what with the zipper. Turned out it had about five inches to go; there was no way I could zip it up all the way without removing some ribs. Going in, I figured that the dress would fit because I had another dress that size in the same brand (Allen B.) that fit perfectly. And when I tried the dress on, it looked great on me. So I was very disappointed; so much so that I did not even consider the two other dresses that I had dragged into the fitting room. I exited JCPenney and walked around the mall. I visited Torrid and found their "optical illusion" dress to be interesting. I took a size 14 and 16 into the dressing room. To my surprise, the 14 fit and looked great, but I was not ready to spend $75 on a dress that did not outshine the $35 JCPenney dress. My feet were not liking my tight shoes, so I visited Payless, which was just across the way from Torrid. They had a bunch of shoes in my size on sale, plus they were having a Buy One Get One (“BOGO”) at half price sale, so I tried on nearly everything they had in my size. I purchased the two most comfortable pairs: a cute pair of black Mary Jane flats and a pair of black open toe sling backs with a 4-inch heel. Despite their heel height, I wore the slingbacks the rest of the day without a problem. By the way, between the sale and BOGO, the two pairs of shoes cost a mere $24.99. The saleswoman at Payless was one I had dealt with a few times in the past at different Payless stores. On those previous occasions, I was always in boy mode, but I tried on girl shoes in the store, so the she knew I was a girly-boy. Now she was seeing me for the first time en femme. I mentioned that fact to her and she knew immediately who I was and was happy to see me in my preferred gender. My last stop was Macy's. They had a much better selection of cocktail and formal dresses, both new and clearance, than the other Macy's. I tried on a half-dozen dresses. They were all very nice and of very high quality, so I was willing to pay more. I narrowed down the selections and bought a "short sleeve, tiered floral lace scalloped hem cocktail dress." But overnight, I got a bad case of buyer's remorse and regretted not buying a long black formal dress with a pearl-embedded halter neckline that was on clearance. The cocktail dress is very nice and it looks good on me, but I have plenty of good-looking cocktail dresses, while I own nothing like that formal. So, I plan to stop at Macy's today and if that dress is still on the clearance rack, it will be mine. UPDATE: I went to Macy’s during my noon break and the dress was still on the rack. I grabbed it and took it to the cash register. The sales woman, who rang me up said it was the last one she had and gushed over how beautiful it was. I told her I tried it on yesterday while I was en femme and it did look beautiful on me. She asked if I performed and we got into a conversation about drag. When she rang up the dress, I was surprised. Its list price was $199, but it cost me only $55. This girl goes out on Wednesday. The weather girl promises that it will be a sunny day with temperatures in the low 40s --- that's pretty, pretty good for late January in this part of the world, so it should be a nice day out. My plans for the day include meeting the girls at a local tea room mid-afternoon for tea and more. I am not big on tea, but I've never visited a tea room before, so I am looking forward to a new experience. Also, I want to visit the mall because I saw a dress on the JCPenney website that will be perfect for my law school reunion. I want to try it on and purchase it if it meets my expectations. On Monday, I did buy a new dress (see photo) online at Ideeli that is more suitable for the office than the reunion. It is so retro (just like me), but it does not ship until mid-February, so I won't know if it fits until then. I am having fun playing with Perfect365; I performed the following makeovers during lunch today. 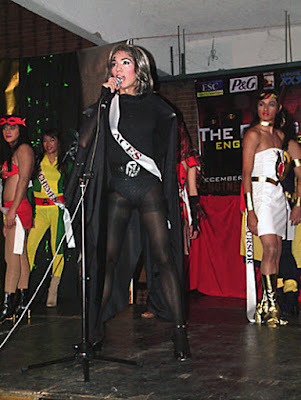 Last Saturday, I presented the first of many webpage links sent to me by Femulate reader Oak featuring photos from the Miss Eng'g (Engineering) womanless beauty pageant at the College of Engineering, University of Philippines-Diliman. In response to that posting, some of you sent me additional Miss Eng'g links - thank-you. I will collate those links with Oak's links and post them here as I reveal the Miss Eng'g links in a yearly fashion. Last week's post referenced photos from the 2001 pageant. This week, I proffer photos from the 2004 and 2005 editions of the pageant. (Updated Below) The Joneses is a short film about a family along their courageous pursuit of love. 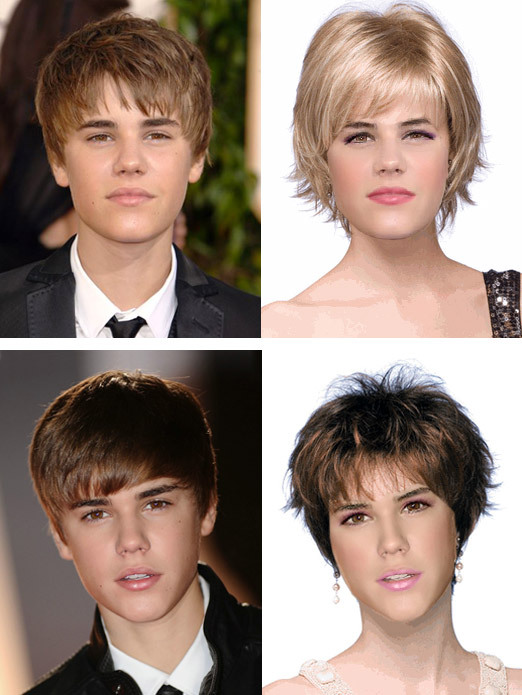 Trevor is a 34 year old virgin, Brad was born with brain damage, and Jheri Rae Jones was formerly their father. Now, as three single adults living under one trailer park roof in small town Mississippi, they are each ready to embark on a journey to find love outside this reunited, close-knit family unit. Kickstarter, the world's largest funding platform for creative projects, is now accepting pledges to fund taking this short film and making it into a full-length documentary. This project will only be funded if at least $27,500 is pledged by Sunday Jan 22, 12:55pm EST. $22,521 has been pledged as of Friday Jan. 20, 7:30 pm EST. If you would like to help fund this project, please visit to the Kickstarter website ASAP. UPDATE: When I posted the above last night, the Kickstarter website indicated that $22,521 had been pledged to this project. This morning, the pledge total was only $14,688. I don't get it! UPDATE #2: The project reached its goal! Dayita sent me a link to an interesting article that discusses the meaning of the "statistical" differences between men and women (and transpeople). As it turns out, height is a pretty bad predictor. Nevertheless, Andee Werthma and Carlos Chavez added a slew of Famous Females of Height to my collection. 5' 9" - Stephanie March - actress - television, "Law & Order: Special Victims Unit"
5' 9" - Michaela McManus - actress - television, "Law & Order: Special Victims Unit"
5' 9" - Tamara Tunie - actress - television, "Law & Order: Special Victims Unit"
5' 10" - Sutton Foster - singer, dancer, actress - Broadway, "Anything Goes"
5'10" - Diane Neal - actress - television, "Law & Order: Special Victims Unit"
This girl bought a new pair of flats from Avon. A "Cushion Walk Exotic Print Loafer" in faux snakeskin with patent leather-like trim, wave-molded footbed, and skid-resistant sole. It is available in sizes 6 to 11, half sizes up to size 10. The shoes are on sale now for $24.99, but they will be $29.99 in the near future. They are a comfortable fit and are very nice looking, too! It is not often that I buy flats, but I could not resist these. One reason I watched the Golden Globes awards show Sunday night was to see the ladies dressed to the nines. By far, my favorite dressed-to-the-nines lady was Zooey Deschanel. I also liked (in alphabetical order) Angelina Jolie, Stacy Keibler, Maria Menounos, Emma Stone, Reese Witherspoon and Evan Rachel Wood, but I thought Zooey was to die for. On the other hand, there also were ladies on the red carpet who lacked fashion sense, for example, Lee Michele, Emily Watson, Kyle Richards, and Julianna Margulies. But hands down, the worst of the lot was Kelly Osbourne, who looked like she was carrying a 1959 Cadillac on her back. By the way, The Huffington Post has a slideshow of 97 dressed-to-the-nines ladies from the Golden Globes. No, I did not wear my baby doll nightgown to bed last night. But maybe I should have because it was one of those rare nights when I remembered my dreams and in one dream after another, I was a woman. Crossdressing was not a component of any dream last night. Instead, I was a woman from the beginning to end of each dream. This is in contrast to dreams of old, where getting dressed or trying to get dressed en femme was a component, if not the primary plot of the dream. In the last dream of last night's set, I was dressed for work. The outfit was similar to one I own, but the hairdo was something completely different for me: very loose, medium brown spiral curls that flowed to the shoulder. I had been thinking about getting a new hairdo that was shoulder-length or longer, but I was not considering loose spiral curls. Maybe my dream was trying to tell me something. Poking around the Internet, I discovered a large collection of photos on flickr belonging to a male-to-female crossdresser named Brian McCloskey. I was very impressed with Brian's huge female wardrobe and fashion sense, but my curiosity piqued when I noticed that there were many photos showing Brian in what looked like a work environment (a library was my guess) with what looked like a variety of co-workers. Was Brian going to work en femme? I *do* dress to work. It was something I always wanted to do - and my coworkers always encouraged me - but I didn't have the nerve until quite recently. 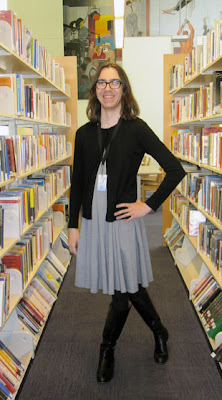 In September of last year I took part in a Living Library event at the library where I worked - I was a "book" that people could "check out" for a short conversation about being a transvestite - and that gave me the courage to dress on a more regular basis. I had thought I might mix it up between boy and girl modes, but....after a couple of weeks I moved all my shirts and ties to the back of the closet and it's been frocks only since then! Brian has a supportive fiancee and circle of friends who don't care how he dresses. I very much care how Brian dresses and applaud him for doing so. Brian can be found online on flickr, Facebook, and Blogger (Brian's current blog and Brian's old blog). ABC has cancelled the controversial cross-dressing comedy Work It after two episodes. This story is so outrageous in this day and age that I cannot believe it! Please sign the petition to stop this nonsense. The Miss Eng'g (Engineering) womanless beauty pageant at the College of Engineering, University of Philippines-Diliman is one of the best, if not the best womanless pageant conducted at an educational institute or anywhere else for that matter. Femulate readers agree with that assessment because whenever I post something about Miss Eng'g here, you readers voice your approval. 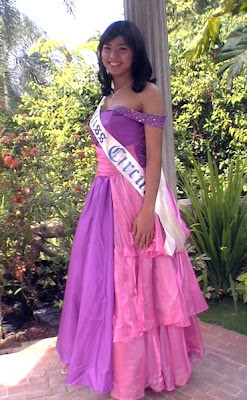 Oak, a Femulate reader and Miss Eng'g fan, combed the Internet looking for more on Miss Eng'g and was very successful. 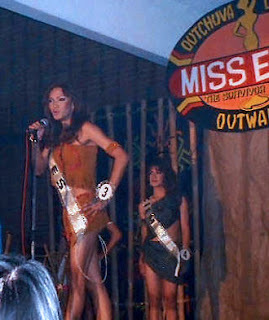 I have a four-page list of links compiled by Oak that go back as far as 2001 that document the Miss Eng'g pageant in photos. The quality of some of the photos is not the best, but the quality of the femulations depicted in those photos is excellent. 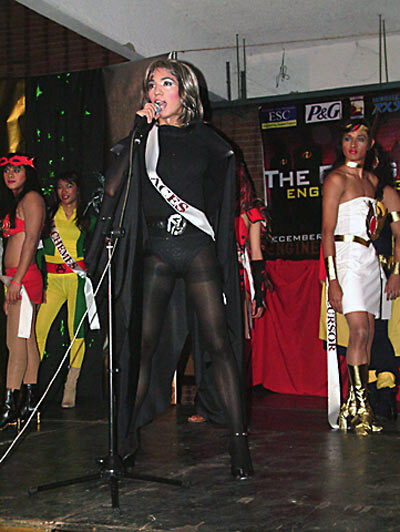 Without further adieu, here is a link to photos from the 2001 installment of the pageant. British film and television actor Sean Bean plays a transsexual in the BBC television court room drama Accused, which will air later this year. Specifically, Bean “plays an English teacher called Simon and his alter ego, Tracie, whose quest for love leads to the courtroom,” according to Daily Mail. Remember that 75% off dress sale that Spiegel had one day last month; the sale in which I bought this $159 dress for $39? The dress arrived, but it is too small or my bust is too big (or actually both). Although it won't help much fitting into that dress, I urge you to buy mass quantities of Girl Scout cookies because of this. Olympic track and field star Bruce Jenner has been outed as a crossdresser. I received an e-mail inviting me to a reunion of my law school graduating class in June and I plan to attend en femme (like her). Gina Duncan is running for commissioner in District 5 in Orange County, Florida. If Duncan won she would be the first transgender commissioner in Orange County history. You can read about here – the comments following the article are disheartening (so far). I have worn bras for nearly 50 years, yet I still learned something new from this short slide show by Daily Makeover. Maybe you will learn something new, too. JD Doyle collects recordings and other stuff related to LGBT music. He has a radio show that features queer music and he has a website where his collection is on display. His collection is vast (1700 webpages) and it gets vaster every day. While searching for female impersonation information a few years ago, his website came up in the search engine results and I have been visiting his site regularly ever since. Being a collector of various stuff, I am in awe of his collecting prowess, particularly in the realm of female impersonation. He has collected a lot of stuff from the professional femulation world and I highly recommend that you visit his site and see it all for yourself; you will be amazed. Queer Music Heritage is JD Doyle's website and his “Drag Artists & Female Impersonators” collection begins here. If you think it is tough being a 6-foot-tall transwoman, try 7 feet! The Huffington Post tells the gutsy story of Lindsey Walker (photo right), a 7-footer, who came out as a transsexual despite her height. Her story is an inspiration for all of us who are afraid to come out and/or go out just because we are tall. Thank you Reva for alerting me to this Lindsey’s story. Her story also appears in other venues. "He" being femulators. "Everywhere" being back-to-back television shows on Showtime. I was away from the computer most of the weekend and was trying to catch up with my e-mails last night with the laptop in my lap sitting in front of the telly with the channel selector stuck on Showtime. Shameless came on at 9. I had never seen the program before, but I like the star of the show, Bill Macy, so I left it on. A sub-plot involves one of Macy's sons who works in a convenience store owned by a couple from the Middle East. The husband is gay and sneaks his lovers out of the store disguised as Middle Eastern women in long black dresses and head scarves. Near the end of the episode, the husband disguises himself in the same manner to runaway from his wife and I assume, to live with his gay lover. House of Lies came on at 10. It is a new show starring Don Cheadle, who I always enjoy watching, so I left it on even though it was past my bedtime. A sub-plot of the show involves Cheadle's school-aged son who wants to try out for his school's production of Grease. The big deal is that he wants to try out for the role of Sandy, the role Olivia Newton-John made famous in the film version of the musical. He succeeds in getting the role. When the school suggests that his son step down and let a female handle the role, Cheadle defends his son's gender choice. Cheadle also agrees to his son's desire to go shoe shopping over the weekend. I lasted about 20 minutes into the show and went to bed, so I don't know if anything else transpired trans-wise. I will try to watch the rest of the show when it is replayed later this week. His alter ego is Trisha van Cleef, who is also a painter with a few CD covers in her portfolio. Paul is very public about Trisha and as such, is one of my heroes/heroines. Trisha has a webpage on Paul’s website and Zagria wrote her up on her A Gender Variance Who’s Who website. Read all about her; she is very interesting. If you have been following along here for awhile, you know that I express myself with graphics as well as with words. I can create a cartoon or fumetti relatively quickly once I come up with the words or punch-line for a joke. On the other hand, Photoshopped artwork can take hours, but I enjoy doing it, so the time flies by when I do it. Kasumi alerted me about Propaganda Party, a monthly event in Tokyo for femulators from the whole trans spectrum (and others who like them). The party is held in the Kabukicho district of Tokyo on the last Saturday of every month. Their website has a huge collection of photos (the photo gallery link is the blue box at the top center of the screen). The pictures are not sexual in nature---just people having a good time at the party. “A tampon maker has been branded 'outrageously transphobic' over its new advert. “Critics say the television spot for Libra [brand tampons] implies transgender people 'are not real women because they do not menstruate,’” according to today’s online edition of the Daily Mail, which you can read here. February 24 was the busiest day of the year with 7,168 hits. August 13 was the slowest day with 3,841 hits. Do you have items in your wardrobe that you are “saving” because they have sentimental value, are “too pretty to wear,” are timeless, or cost a lot of money? I don't know about you, but that pretty much describes moi to a T. As a result, my closets are overflowing and I can use help. To the rescue, Ginger Burr wrote an excellent post on her blog that proffers three reasons to stop saving your clothes. You can read it here.